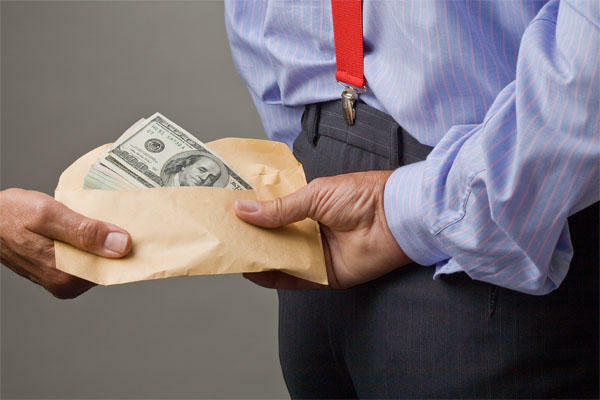 Bribery stock image. Picture: Lowvelder. It seems that ANC officials – even at a fairly low level – are not shy in viewing community assets as their own. The saying, “a fish rots from the head”, seems true of SA today and the ANC government. The organisation’s leaders are getting fingered for involvement in corruption, looting and state capture – and every day seems to bring new revelations. It is painfully apparent that many of them joined the struggle not to serve their fellow South Africans, or provide a better life for them. They saw politics – specifically of the ANC variety – as a road to riches. With that example, it is not surprising that the cancer of corruption and theft is eating its way through society. So, our story today about the “small nyana” (to quote Bathabile Dlamini’s famous words about her ANC colleagues and the skeletons in their closets) corruption in Emfuleni shows that the party’s officials – even at a fairly low level – are not shy in viewing community assets as their own. An ANC councillor in Emfuleni has allegedly been hiring out a community hall, owned by the municipality, and pocketing the money. It is worrying that he was brazen enough to do this, but where were the controls which should have flagged this as a crime?